by Chris Woodford. Last updated: March 17, 2019. Do you read me, over? Yes, I read you, over. If you've never had the pleasure of communicating by walkie-talkie, you don't know how much fun you've been missing! Before cellphones became popular during the 1980s and 1990s, walkie-talkies were the most effective way to share information over short to medium ranges—and they're still widely used by police officers, military personnel, and the organizers of public events. What are they and how do they work? Let's take a closer look! Photo: Testing, testing, 1-2-3. 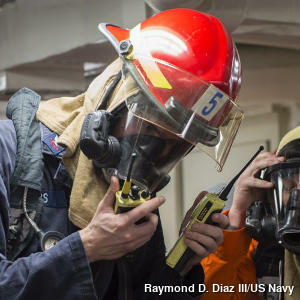 This naval technician is checking the communication between a pair of walkie-talkies. Photo by Raymond D. Diaz III courtesy of US Navy. Walkie-talkies are handheld, portable radios: they communicate wirelessly (using radio waves) on a single, shared frequency band. 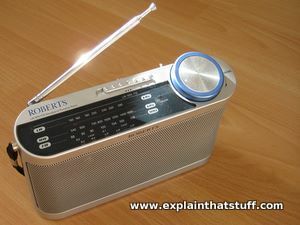 Each battery-powered unit contains a transmitter/receiver and antenna (for sending and receiving radio waves), a loudspeaker that often doubles up as a microphone when you talk into it, and a button that you "push-to-talk" (PTT). The loudspeaker/microphone works in much the same way as an intercom: because a speaker and a microphone contain essentially the same components (a coil of wire, a magnet, and a paper or plastic cone to pick up or generate sounds), you can use a single device to do both jobs essentially by switching the electrical circuit into which it's connected and reversing the current. More sophisticated walkie-talkies (like the Motorola model shown in our photos) contain separate loudspeakers and microphones. Screenshot: Walkie-talkies have entered the 21st century thanks to apps like these two. Above) Walkie Talkie Standard from Indigo Penguin. It converts your smartphone (or iPod Touch) into a walkie-talkie that can communicate with others nearby. 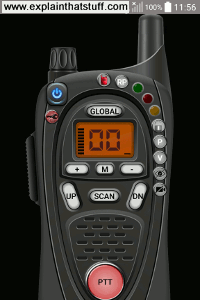 Below) Online Walkie Talkie Pro from NAVA apps for Android. You'll find lots of similar apps if you search for "walkie-talkie" in the iTunes Store or Google Play (for Android). How do you use a walkie-talkie? A group of people who are using walkie-talkies to talk to one another have to tune in to the same frequency band, which is called a channel. Their radios are all "receiving," so their microphone/loudspeaker units are working as loudspeakers and probably hissing with static, a bit like a conventional radio that's not tuned into any particular station. 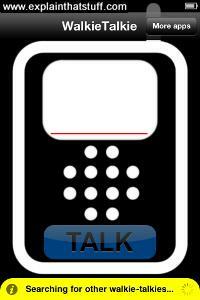 When someone wants to to talk to the others, they hold the push-to-talk button on their handset. Their radio goes quiet as their loudspeaker switches over to a microphone. As they talk into it, their words are converted into radio waves and beamed out on the prearranged channel (typically at a frequency around 460 MHz). Since radio waves are part of the electromagnetic spectrum, they travel at the speed of light (300,000 km/second or 186,000 miles/second), so the waves are picked up almost instantaneously by the other handsets. The radio waves are converted back into fluctuating electric currents and the loudspeakers use those to reproduce the sound of the talker's voice. When the talker has finished, he or she says "over" (meaning my bit of talking is finished) and releases the push-to-talk button. The radio now switches back into listening mode and someone else can talk. Unlike a normal radio, which will only pick up broadcast voices or music from a radio station, a walkie-talkie is a two-way radio: you can both talk and listen (send and receive). The main drawback is that the same frequency channel is used for both things, so only one person can talk at a time. When communication devices work this way, they're described as half-duplex (a single channel allows communication in only one direction at any one time), as opposed to full-duplex (where you can talk and listen at the same time, as on a telephone). Photo: This is a typical one-way radio: it will receive things like music broadcasts from radio stations, but it can't transmit. A walkie-talkie can send and receive, so it's called a two-way radio. Walkie-talkies are robust, easy-to-use, and simple (with relatively few parts and features), so they're brilliant for use outdoors and great for children (or for children who need to stay in touch with parents, for example, on vacation). They're particularly handy in places where cellphone network coverage is poor or unavailable (in disasters or emergencies, for example). They're also great fun: kids love doing the "over" and "over and out" business. They're very handy in situations where lots of people need to listen and only one needs to talk at once (for example, if you're giving instructions to workers on a camp site). They're extremely convenient, weighing just 100–200g (3.5–7 oz); work over a decent range (typically 5–10 square km or 2–4 square miles); and have long battery life (20 hours on 3–4 rechargeable or alkaline batteries is typical). 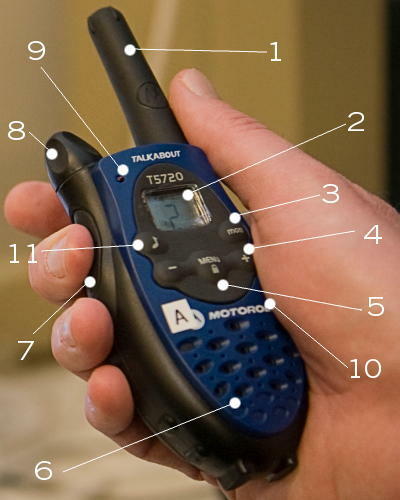 Walkie-talkies generally have multiple channels (from about 8 to 25 or more) so you can easily switch to another frequency if other people are also using walkie-talkies nearby. Some walkie-talkies can also be used as baby-monitor intercoms. Most inexpensive walkie-talkies are analog units, so they're subject to interference and relatively easy to eavesdrop (more expensive digital units get around interference, but generally only military walkie-talkies use encryption to overcome eavesdropping). Walkie-talkies are not designed for communication over longer ranges (for which you'll need something like CB radio or a cellphone). What are the parts of a walkie-talkie? Photo: Photo of Motorola Talkabout T5720 by Jhi L. Scott courtesy of US Navy, with annotations by explainthatstuff.com. Antenna: Sends and receives radio waves. LCD display: Shows channel number, remaining battery life, and so on. Monitor: Switches the walkie-talkie to monitoring mode so it can be used as a listening device or baby monitor. Menu select buttons (marked with plus and minus symbols). Menu button: Used for changing functions and settings. Can also be used to lock the keypad to prevent the channel or other settings from changing accidentally while the radio is in your pocket. On/off switch and volume control. LED indicator light shows when channels are busy. Microphone: Unlike some models, this walkie-talkie has a separate loudspeaker and microphone. Transmit call tone: This sends a tone signal to other radios on the same channel alerting them that you want to talk. Artwork: An illustration from one of Gross's walkie-talkie radio patents. Although you can't deduce how it works from this, you can see a few of the basic components, including the triode amplifier (red, center), three "chokes" (frequency filters, orange), and a capacitor (green). You can find out more about how it works in US Patent 2,698,380: High-frequency transmitter and receiver, by Irving A. Gross. Artwork courtesy of US Patent and Trademark Office. Walkie-talkies (originally called two-way radios or "pack sets") were invented in 1937 by Canadian Donald Hings (1907–2004) and, around the same time, by American inventor (Irving) Alfred Gross (1918–2000). Both men saw their inventions developed for military use during World War II; both went on to devise numerous other inventions: Gross is credited with inventing pagers, which were a popular way of staying in touch on the move before cellphones became ubiquitous, while Hings developed numerous improvements to radio, radar, magnetic ground-surveying devices, and equipment for measuring air pollution (he has 39 different inventions listed at the US Patent and Trademark Office). Hello World: A Life in Ham Radio by Danny Gregory and Paul Sahre. Princeton Architectural Press, 2003. Before the Internet came along, people used radio to meet and talk to friendly strangers in other countries. Signor Marconi's Magic Box by Gavin Weightman. Da Capo Press, 2003. A biography of radio's best-known pioneer. Smartphone? Presto! 2-Way Radio by David Pogue. The New York Times. September 5, 2012. The pros and cons of smartphone walkie-talkie apps..
A Bicycle Headset Doubles as a Walkie-Talkie by Roy Furchgott. The New York Times. June 22, 2012. Reviews a simple headset walkie-talkie that cyclists can use to talk to their nearby friends. Turning mobiles into walkie-talkies: BBC News, 26 September 2003. Announcing the development of push-to-talk walkie-talkie services for cellphones, which are like a cross between instant messaging (IM) on a computer and traditional walkie-talkie messages. With Family Radios, the Walkie-Talkie Comes of Age by Roy Furchgott. The New York Times. April 6, 2000. This old article from the Times is still a decent summary of the advantages of two-way walkie-talkies over cellphones for short-range communication. 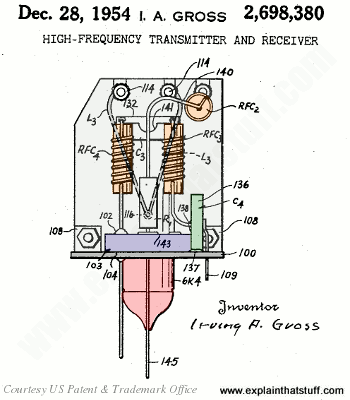 US Patent 2,698,380: High-frequency transmitter and receiver by Irving A. Gross, granted 28 December 1954. This is Alfred Gross's original walkie-talkie patent, in which he describes his objective to create a small, lightweight, highly portable radio transmitter and receiver that is rugged enough to withstand "the shocks and abuse to which it is put by civilian or military use." Another objective was to make what he called a "stable" radio that could hold its frequency very reliably—and this patent describes an electronic circuit designed to do just that. US Patent 2,760,056: Radio tuning apparatus by Irving A. Gross, granted 21 August 1956. This patent, filed around the same time, describes the tuning mechanism inside Gross's walkie-talkie.